This Raiden Statue Wins. Flawless Victory. Toytality. 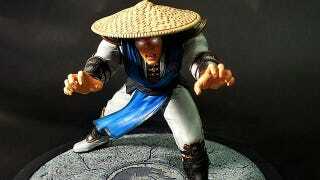 When Syco Collectibles showed off their line of Mortal Kombat statues the other day, sadly one of the main attractions, a Raiden piece, wasn't done. He is now! These shots show you can...take his hat off. And that he's mean. What they don't show is that this 10" piece, made of polystone resin, will be out in Q4 this year and will sell for $165. You can check out pics of Syco's other Mortal Kombat statues here.